Spring weather is finally here on Long Island and spring beer festival season is well underway. Beer lovers enjoyed sunny skies at the Blue Point Cask Ales Festival on April 21 and the Spring Craft Beer Festival at Belmont Park on April 28. Many more festivals and other events, including Long Island Craft Beer Week, are coming up in May so be sure to check out LIBeerGuide.com's Events page so you don't miss out on the fun. 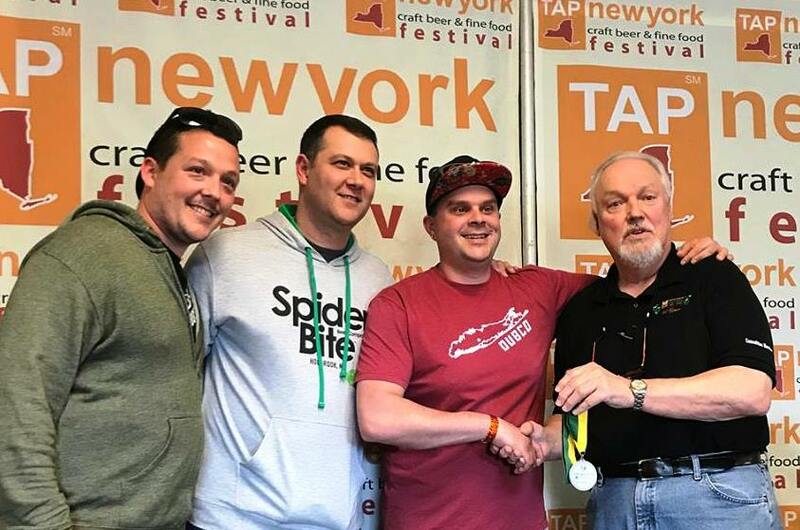 The 21st annual TAP New York Festival was held at Hunter Mountain on April 28-29 with craft breweries from across New York State submitting their best beers in competition for NYS bragging rights. 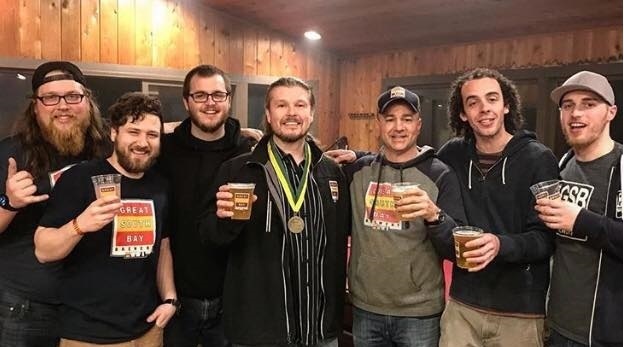 Several LI breweries won awards including Great South Bay Brewery, which took home a Gold Medal in the New England IPA category with Nauti Girl IPA and a Bronze Medal in the Light Lager category with GSB Pilsner. Spider Bite Brewing and Destination Unknown Beer Co. (DUBCO), both big winners at last year's TAP New York festival, followed up this year with a Silver Medal for a collaboration beer in the Old/Strong Ale category. RyeNo Aged Barleywine, made primarily with rye and aged in rye whiskey barrels, weighed in at a smooth 12% ABV. Also coming home with an award was Port Jeff Brewing, which won a Silver Medal in the Belgian Ales category for Triple H Strong Ale. Thousands of LI beer lovers enjoyed one last festival at Blue Point's original River Avenue brewery on April 21. The 15th annual Cask Ales Festival featured over 200 cask ales from more than 70 breweries from across the U.S. and five from England, where cask-conditioned beers were first produced hundreds of years ago. LI's three homebrew clubs -- Brewers East End Revival, Handgrenades Homebrew Club, and Long Island Beer & Malt Enthusiasts -- also served dozens of the naturally carbonated ales. 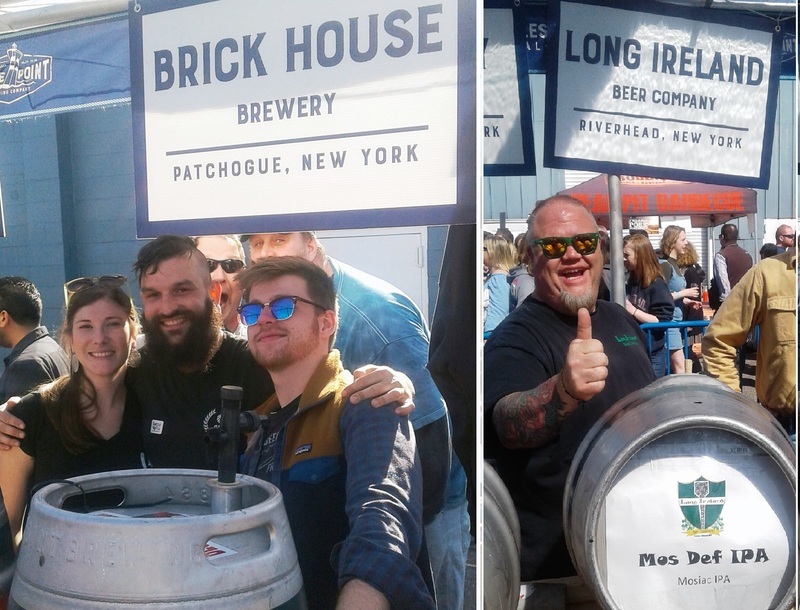 Blue Point's cask master Jim Richards pulled out all the stops for the last Cask Ales Fest at River Avenue, making 14 cask ales including several with special ingredients from local companies such as Amagansett Sea Salt, Martha Clara Vineyards and Montauk Rum Runners. Blue Point was founded on River Avenue in 1998 by Mark Burford and Peter Cotter and held its first Cask Ales Festival in January 2004 in the middle of a blizzard. 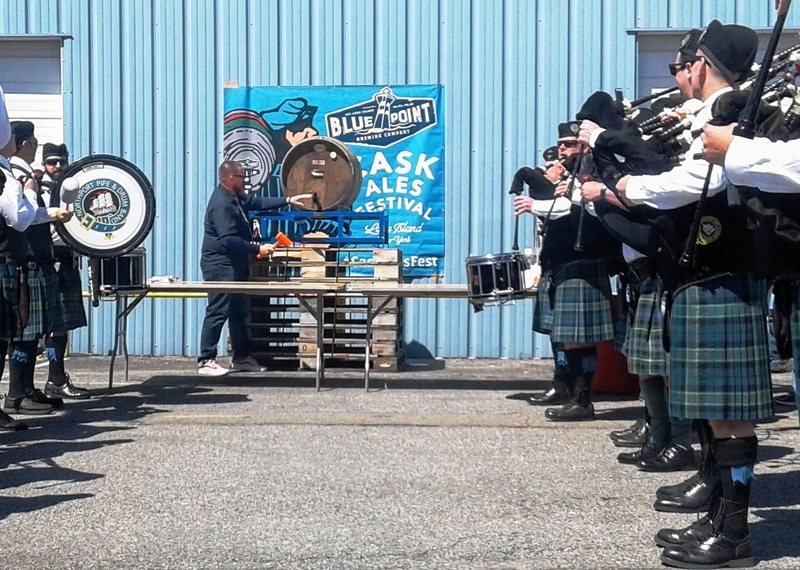 After a few years the festival was moved to April and has grown to become one of the largest cask festivals in the U.S. Next year's festival will be held at Blue Point’s new brewery on West Main Street, scheduled to open this summer. The new 60,000 square foot brewery, on the former site of Briarcliffe College, will feature a tasting room overlooking the brewhouse and an outdoor beer garden, along with plenty of room for brewing and storing cask ales. The annual Long Island Craft Beer Week celebration will run this year from May 11 to 20 with dozens of events across LI. 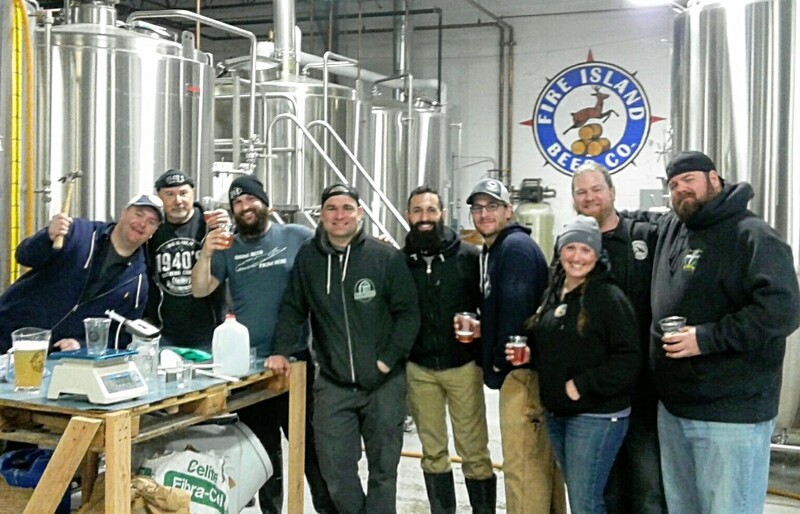 The first weekend of the celebration will focus on Nassau County, with a cask ales festival in Farmingdale on May 11 and a "Town Takeover" on Main Street in Farmingdale on May 12 with opportunities to meet and greet brewers. The second weekend will focus on Suffolk County, with a caskfest on May 18 at L.I. Pour House in Port Jeff Station and a Town Takeover on Main Street in Patchogue on May 19. Long Island Craft Beer Week will again hold its “Can for a Can” food drive, where you can pick up a can of special Craft Cares collaboration beer at participating locations by donating cans of food to Long Island Cares/Harry Chapin Food Bank. This year's Craft Cares beer is a Bi-Coastal IPA combining two popular IPA subcategories, New England IPA and West Coast IPA, and using 100% LI hops donated by Route 27 Hop Yard in Moriches and North Fork Brewery and Hop Farm in Peconic. According to Dave Schultzer of Bellport Cold Beer and Soda, one of the organizers, the “Can for a Can” drive raised 3,500 pounds of canned food in 2017 and this year hopes to top 5,000 pounds. More information on events for #LICBW2018, including info on the commemorative pint glass pickup, is available at www.licbw.us. Bunker Hill American Taproom, Wantagh - this stylish tavern took over a small space formerly occupied by RP McMurphy's and added a large dining room. 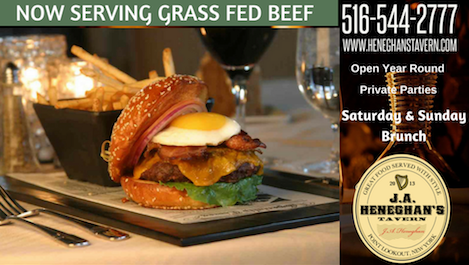 20 beers are on tap and an inventive menu has pub favorites including tasty burgers and salads. Brew Brothers Grille Huntington - this is a second location for the Franklin Square favorite which has won awards for its chicken wings since opening in 2009. The new location has two floors, with a beer hall on the second floor and 40 taps including LI craft brews. In addition to wings, the menu features burgers, tacos and other pub food. Brew & Beyond, East Patchogue - new location for the homebrew shop, which moved west from Calverton. The shop holds brewing classes and hosts bottle swaps for local homebrewers once a month. 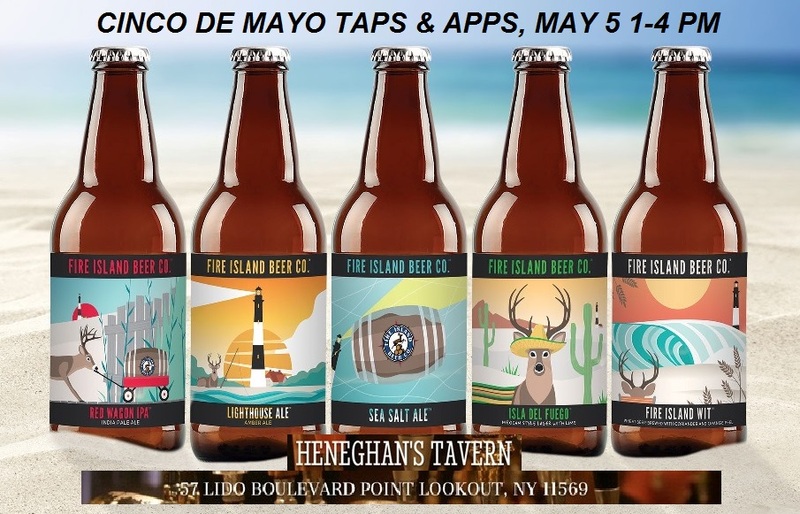 May 5 -- Cinco de Mayo Taps & Apps at Heneghan's Tavern in Point Lookout, 1-4 pm. Delicious Mexican apps paired with beers from FIre Island Beer Co.
May 12 -- Nautical Mile Craft Brew Fest at Tropix on the Mile in Freeport. Two sessions, 1-4:30 pm and 6-9:30 pm with food and live music.